As part of the Smart series of cameras, the Olympus VG-170 is a dapper looking digital compact camera with a 14 megapixel CCD sensor, 5x optical zoom and a 3 inch LCD screen. The main addition to the VG-170 is the massive flash that sits in the top left corner above the lens. With a Guide Number of 8.8 it gives the range of the VG-170's flash around double of any comparable camera. Other key features of the VG170 include 720p HD movies, a range of magic filters, 3D still images and a retro design. 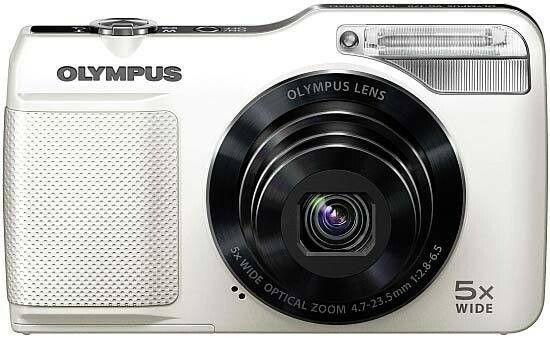 Priced at just £99.95 / €100, the Olympus VG-170 is available in black, red and white. The first thing we thought of when we saw the Olympus VG-170 was "look at the size of that flash!" It dominates the front of the camera even more than the large lens barrel that houses the 5x optical zoom. On the white model that we had for review, the lens remains black, which is unusual but not bad looking. In fact it's a nice little camera to look at. Next to the lens is a small, leatherette grip to hold onto when shooting or carrying the camera between shots. The top of the VG-170 holds the power button which is black to match the plastic strip that separates front from back. A silver shutter release sits next to it with the zoom rocker wrapped around it. The left side of the body raises up to accommodate the flash unit. A massive 3 inch screen sits on the left side of the camera at the back. To the right, only one button is allocated for menus which is joined by the navigation pad. A playback button and dedicated video record button also occupy the space that the screen isn't using. We understand that there has to be some cost cutting involved in getting the camera under £100 so the USB cover is made from bendy rubber and not colour coordinated with the white body. Still, it's surprising to see a cover at all compared with what some other manufacturers do. The battery cover on the bottom of the camera has no metal reinforcement and bends badly. The reason behind not having more than one menu button is simple - the Olympus VG-170 has a permanent menu system on-screen while shooting. It's similar to the function menu seen on Canon cameras which has been widely adopted by other companies and all you have to do with this one is press down on the navigation pad. This menu covers the most used features of the camera such as flash, including the long flash. This is the mode you need to be in to take advantage of the oversized bulb. It's worth noting here that in long flash mode, the camera will knock the resolution down to 5 megapixels and use auto ISO to ensure a perfect shot. In the function menu, there's also access to macro, ISO, white-balance, self timer and drive options. For more core features, you must enter into the main menu by pressing the button at the bottom of the camera. There are six tabs on the left when the Olympus VG-170's menu button is initially pressed. They each have an allocation to a specific area of the menu such as shooting, playback, video and set-up. The camera defaults to the selection box highlighting the options in the tabs. To highlight the tabs themselves (for quick navigation through the entire menu), pressing left will do this. Alternatively, pressing down will scroll through the many options available (seven on each tab). The menus are easy enough to use. Everything is explained clearly with a small scrolling explanation at the bottom of each page. The design is black with white writing which is easy to see even for people who are hard of sight. Olympus have ditched the xD card format and now use the more popular and readily available SD cards, which slot into the compartment next to the battery. The VG-170 is also Eye-Fi compatible. If you're unfamiliar with this format, Eye-Fi cards are wifi enabled SD cards. They will send your pictures straight to your computer when they enter a free wifi hotspot – arguably the only time a hotspot makes a good spot. This will be of particular interest to younger generations travelling after university who want budget camera and don't want to carry a load of cards around with them. In addition to this, the battery charger is built into the camera meaning that there's less to carry. Also, the lead will detach from the mains plug turning it into a normal USB lead for downloading to a computer or charging from a computer. That way, if you are travelling, you can go to an internet cafe and charge your camera. Should you decide against using Eye-fi, the camera is also SDXC compatible so can accommodate cards that have huge memory sizes. It seems that Olympus DSLR technology is rubbing off on the compacts because the VG-170 is pretty fast at focusing., It seems to hunt a lot less than other digital cameras too. There are two macro facilities on the Olympus, Macro and Supermacro. Normal macro has a close focusing of 20 centimetres to infinity at wide while normal focusing is 60cm to infinity. Frankly, we saw no difference in performance keeping it in macro all the time and using those additional 40cm without having to go into the menu system. Supermacro can go as close as 5cm which is even better but using this mode disables the zoom. As well as being on the speedy side, the focusing system is also pretty sharp. We're impressed by the sample shots we got during our time with ithe Olympus VG-170. n the menu, you can watch all the pictures as a slideshow, edit them, erase, protect and rotate them. Editing options include compressing the picture to create more space. This is useful if you need to free up card space and have a few full resolution pictures that you know for sure will only end up online in a Facebook album or similar. There's an option to crop the picture, add audio and there are three fix options for beauty, lighting and red-eye. They use digital effects and subroutines to assess the picture and make it "perfect". There are some pretty cool things in the box with the VG-170 digital compact camera. Aside from the usual stuff consisting of a Basic Manual (5 pages out of 147 dedicated to each language), a CD with the full manual and Olympus Viewer 2, and a USB lead that doubles as a charger with the mains adapter and battery, there's also two pairs of 3D glasses for viewing the 3D pictures that the camera can take. That's right; 3D. But not this new fangled global craze 3D which is over-saturating a local cinema near you as we speak. No, this is old school. We're talking red and blue lenses so we look like 3-D from Back to the Future. It's disappointing that the glasses don't have arms so they have to be held in place. Still it's nice to use them and see some old-school 3D pictures, not these modern realistic types.